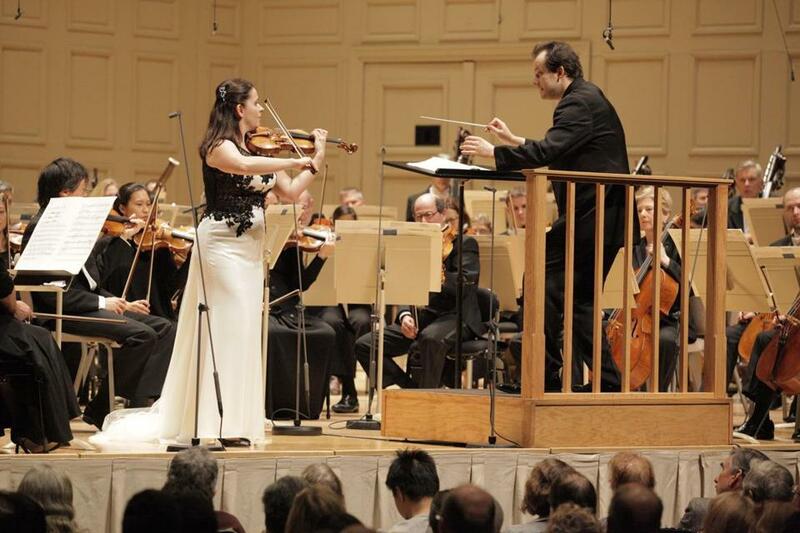 Violinist Baiba Skride and conductor Andris Nelsons performing with the Boston Symphony Orchestra on Thursday night. It’s often said that the past is another country, and if so, then the musical past must be one too. Over the course of a tragic 20th century, certain Soviet composers refined techniques of inner emigration, finding in the spare dignity of Gregorian chant or the geometric beauty of Bach’s music, cherished escapes from the gray prison of the now. Sofia Gubaidulina’s stunning “Offertorium,” composed in the late1970s and back this week at Symphony Hall, is a case in point, a Brezhnev-era creation that soars far above its times. Gubaidulina lived as a child through Stalin’s terror, and later as a deeply religious artist accomplished a kind of double-pivot, exploring the radical techniques of the West but also forging a highly personalized music of great mystical intensity. Her best scores interweave a spiritual and musical avant-garde, empathy and anarchy, so thoroughly they begin to feel like one and the same. “Offertorium,” for solo violin and orchestra, opens with a quotation of the “Royal Theme” from Bach’s “Musical Offering.” The theme is heard nearly in its entirety, contemplated in music of prismatic wonder, and then slowly denatured in a solution of dissonance, violent trills, and jagged figuration, until all that remains is a single F-sharp, carried forward by the violin like a talisman. The music of the work’s middle section darkens and appears to have forgotten Bach altogether, before ultimately retrieving a version of the theme note-by-note, as if from the abyss of memory. In a gorgeous closing chorale-like passage, the solo line turns burnished and wise, borne forward on currents of lower strings. It’s true that Gubaidulina honors Bach and Webern, but it is also the stricken beauty of Berg’s Violin Concerto that seems to gather at the margins of this score. Gubaidulina wrote “Offertorium” for the formidable violinist Gidon Kremer, who championed it widely and recorded it with the Boston Symphony Orchestra. The BSO has programmed it only once since Kremer’s fabled local premiere, but on Thursday night the piece returned in a harrowing performance under the baton of Andris Nelsons. The BSO’s new music director grew up in Riga and was 13 when the Soviet Union fell. His sympathy for this idiom is palpable, and Thursday’s account was alert to every coloristic detail and shattered-glass chord. The young Latvian violinist Baiba Skride took up the fiercely difficult solo line. She in fact plays the work on Kremer’s violin, on loan to her, but she finds her own way with it, placing fearless technique at the service of a streamlined sincerity. At key moments she favored a fast narrow vibrato that felt tailored to the music’s particular expressive goals, its anatomy of an embattled rapture. Nelsons held the hall in silence long after the work’s final stratospheric D had evaporated. After intermission, the conductor returned with an earthy and rousing account of Sibelius’s Second Symphony, one that had the BSO sounding fully committed to his vision. It’s also never a bad sign when audience members can be spotted afterward, singing on the sidewalks. Jeremy Eichler can be reached at jeichler@globe.com. Follow him on Twitter @Jeremy_Eichler.